She looked at the pen. The beautiful, sleek thing, in a not-so-beautiful hand. A hand worn out, with roughly cut nails. She could fell the urge to produce some form of writing from the nib of the pen growing stronger. She thought of all the beautiful blue ink contained by the pen. She searched inside herself for words, for inspiration, for aim. She found none. Inspiration? No, not even that. In fact, she was rather disappointed to find desperation. Desperation? Was she desperate? Yes, she found out, she was. But what for? She searched deeper inside for the answer and found it. She was desperate to write. She was desperate to allow her emotions run free. She was tired of restricting them to her heart. The words she knew she could never utter,they must be written. They could not be allowed to accumulate inside her. No. That was silly! She decided this absurd ‘fear of empty pages‘ and ‘inability to write‘ nonsense must come to an end. And the solution was to write. On an empty page. She smiled a satisfied smile. A thought can never be yours. These thoughts, they have a mind of there own. They can choose where to appear, and who utters them. A thought is never yours until you utter it or write it down. It’s the same with ideas, too. You have an idea, but you choose to keep it to yourself. then someone else says the same thing, and you tell people how that idea or thought is yours, but nobody believes you now. You cannot convince them. The idea is lost. But then, you have another idea. You tell it to the masses, they do not doubt your originality for a minute. No matter how many other people say they had the same idea, the idea is now attributed to you. Forever. It is yours. P.S. This idea about ideas is not mine. Wasif Ali Wasif was the one who introduced me to this. He is dead now, but is truly one of the most inspirational writers in the history of Urdu literature. Of those beautiful waterfalls, those green lands. I sat by the river on that huge rock, my toes sinking deep inside the silty water, my hand resting on a big slimy rock beside me. Here I was, my leggings folded up just enough not to get wet, trying to hide my bare ankles in the water. Cold sweet water as my sole companion, algae floating where the rocks where close together, the sound of a roaring river echoing for miles. I turned around and saw my mother sitting on a huge rock, looking tired, the picturesque Swat Mountains looming in the background. The water was so cold, yet it was divine to be sitting there alone, though my family was all around me. Far away, I could see my sister balancing on the rocks, my brother rushing to join her. On my right my father was standing beside my grandfather sitting with his feet in the water, while an old Khan Sahib stood their talking to them. Further on, my uncle sat with his wife, staring ahead into this majestic body of water. Khan Sahib’s wife and daughter came stumbling down this somewhat rocky riverside, grandmother tumbling with them. I concentrated on the mud in the water. Letting go of my Kameez, which one hand had been clutching to keep it from falling in the water, I immersed both my hands deep into the mud. The flowing water washed off the dirt on my hands and I heard someone talking in the background. I drowned away all the sounds except of the river; after all, you didn’t get this atmosphere in the plains of Punjab. The theme of this composition is the peace and simplicity of Swat. I have been to the Northern Areas, Gilgit Baltistan, from Skardu to Khaplu, Minnimerg to Chalas and what always struck me was the simple lifestyles, folks with not a care in the world, free from all materialistic desires. 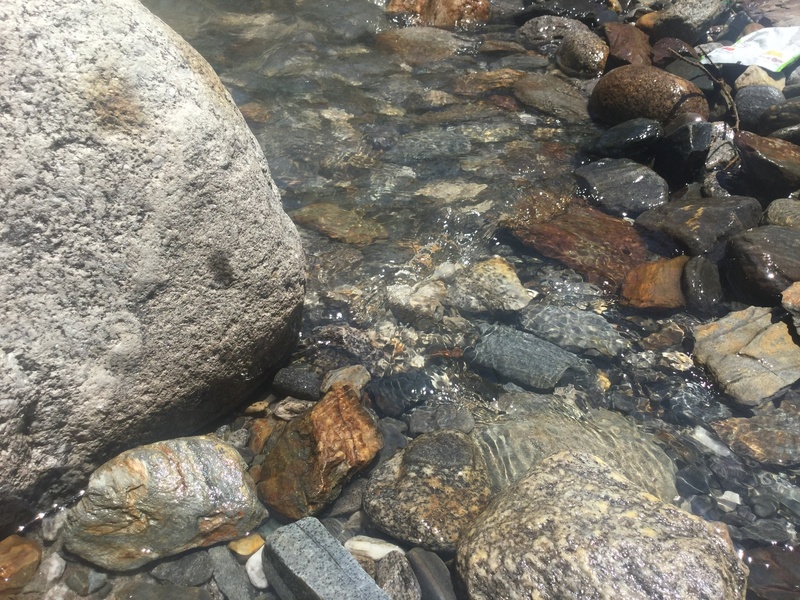 So content are they in their lives, their minds as pure as the rocks in river Swat, whom the water cuts everyday but they are coated with that special slime, that enables them to stay rooted in their places and allow the water to slip away. They are not educated as we are, nor do they have huge houses and acres of land, but they are content. And perhaps that is the reason for their contentment. We are educated, but we use our education as a means of acquiring wealth and worldly possessions, this race to stay up-to-date on everything has lost us our values, our aims. Our purposeless lives have rid us of our identity, our culture while their simple lives are the pride of the nation. We have lost all sense of honour, integrity, courage, wisdom, identity and selflessness while these values are integrated into their system so firmly. It is true that they may not surpass us in their material wealth but it is also true that their wealth is in their cosy small dwellings. While we, so lost in our materialism race that the river carries us off like the sand, forever restless, never to settle again.